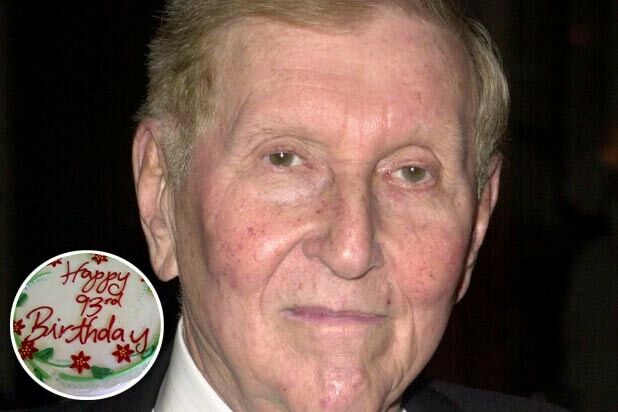 Sumner Redstone has always said he will never die, and so far, he’s been right. On Friday he will turn 93. In 1979, in his mid-50s, he survived a hellish fire at Boston’s Copley Plaza Hotel, set by a recently fired bus boy. Engulfed in flames, Redstone made it out to the third-floor ledge and hung by one burning hand to his windowsill until firefighters saved him. After sixty hours of operations and months in the hospitals, his doctor offered congratulations. “Listen, Sumner,” Dr. Burke told me, “everything we know is on your body. Bone grafts, skin grafts” – my toes were nailed to my foot – “and the reason you’re alive is you.” Determination, physical or any other kind, is the key to survival. Redstone’s latest struggle — a fight between his ex-girlfriend and his daughter, and some nonsense about a family trust? — this is nothing. The man’s been through a fire. But everyone else thinks he is going to die. Therein lies the problem. You’ve probably been skipping over lots of confusing stories lately about Redstone removing Philippe Dauman, his successor as executive chairman of Viacom, from a family trust that will control Redstone’s $5 billion-plus fortune if — if – Redstone ever dies. What all of these stories boil down to is this: Lots of people think Redstone no longer calls the shots. So who is standing in for him? She is only the latest person accused of having an undue influence over Sumner. A judge recently dismissed a lawsuit in which his ex-girlfriend, Manuela Herzer, asked to be placed back in charge of his health care. Dauman was briefly in charge of Redstone’s health decisions, before he was booted from the family trust. Everyone, it seems, is touchingly concerned about the state of the 93-year-old billionaire’s health care. Everyone, of course, except for Sumner Redstone, because… well, you know. “The biggest media merger in history might never have happened were it not for a hotel fire set by a disgruntled teenage busboy 20 years ago,” the New York Daily News wrote in 1999. In other words, the fire put a fire under Redstone. He was born in Boston in 1923. His father, Michael Rothstein (Redstone is the English translation of the German-Jewish name), owned a chain of movie houses that evolved into a company called National Amusements. He served as a World War II codebreaker. He went to Harvard, then Georgetown Law, then Harvard Law. In 1987, he orchestrated a hostile takeover of one of the companies he had invested in, Viacom, owner of companies like the then-new MTV. He hired Dauman as his lawyer, and, according to the Wall Street Journal, got in the habit of calling him each morning at 5 a.m. Just to check in. Redstone, working insane hours and still recovering from the fire, worked sometimes in pajamas and a bathrobe. He walked around in loafers loose enough not to irritate his scarred feet. By 2000, his acquisitions included Paramount, Blockbuster Entertainment and CBS, among other companies. He finally, finally stepped down as chairman of Viacom and CBS in February, amid questions about his mental competency. Now, with his competence debated in court and statements to the media, his daughter is back in his life. And his other loved ones/friends/protectors/stakeholders/potential recipients of his fortune accuse her of undue influence. “What is interesting is that the most exciting things in my life have happened after that fire,” the Daily News quoted him as saying. But this is also a love story, and a ghost story. Last year, Redstone’s ex-girlfriend, Herzer, asked that Redstone be deemed mentally incompetent and that she be restored as the person in charge of his healthcare. They had met some two decades earlier at a dinner party thrown by Redstone’s friend Robert Evans, the producer who famously explained in “The Kid Stays in the Picture” that luck is when opportunity meets preparation. “They dated for around two years. Redstone wanted to marry her, but Herzer was not interested in getting re-married. She says she put caring for her young children before Redstone, a fact he did not appreciate,” wrote Vanity Fair. But she stayed by his side and directed the army of servants taking care of him. In October, she was ejected from his home and taken out of his will, for reasons that are unclear. More charges arose of undue influence. Herzer subsequently filed a lawsuit, saying he wasn’t in his right mind, and needed her to care for him again. She called him a “living ghost,” which of course he is: He could have died 37 years ago in the fire.